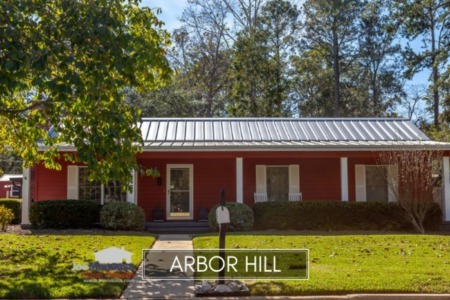 Just south of Killearn Estates you will find Arbor Hill, a neighborhood with excellent access to town and a premium location in Northeast Tallahassee. 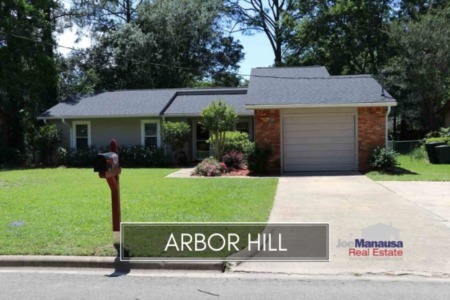 Last time I wrote a home sales report on Arbor Hill, I identified this subdivision as one of the safest investments in Tallahassee, and that has not changed. The value that recent buyers have picked up here is incredible, and whether they are investors or owner-occupants, they will look back at their purchases as wonderfully fortunate timing. In this report, we will look at average home prices, average home values, and the average sizes of homes in Arbor Hill, as well as show current listings in the Tallahassee MLS and all closed home sales going back to 1991. For each of the three real estate graphs found in this report, you will find the number of closed home sales for each year (blue columns, measured on the left vertical axis), and an important real estate statistic shown in orange (measured on the right vertical axis. It is important to note that the analysis of the information that we provide is current through the first week of May 2015. Average home prices in Arbor Hill continue to fall, down a staggering 53% since the peak of the housing market in 2007. This is most likely due to the fact that 37% of all home sold in this Tallahassee neighborhood in the past year have been distressed sales. But I can promise you this ... these homes are now part of a market where supply and demand have come into balance, and perhaps even moved to a seller's market. The next time we do a housing report on Arbor Hill, you can be certain that average home prices will be significantly higher. Average home values in Arbor Hill have not changed much since they hit a market low back in 2012. Needless to say, now is a great time to buy a home in Arbor Hill. As the final short sales and foreclosures clear the market, expect average home values to rise by 15% or so right away. In 2015, the average value of a home sold in Arbor Hill has been $97 per square foot. This is about 40% cheaper than it would cost to build an equivalent sized home in the neighborhood, and this discount to cost is why I consider this area to be about the safest investment in the Tallahassee real estate market. The 6 home sales in 2015 have averaged 1,086 square feet, meaning recent buyers have scooped up the smaller, less expensive homes. I hope you enjoyed our May 2015 update on home sales in Arbor Hill, please feel free to drop me a note if you have questions not covered in this report.